As has become my pregame ritual, I arrived at the stadium nearly three hours before first pitch. I walked around for a while and met some lovely people sitting outside the gates. Although the Rays have been playing well as of late, they unfortunately remain at the bottom of the attendance lists every year. As they were playing the Orioles, I fully expected to see a fair amount of O's shirts in the crowd. I met a mother and daughter (pictured right) who grew up as Orioles fans, but have since adopted the Rays as their second favorite team since moving to Tampa. This was a trend that I saw forming very quickly as I talked to more people in the crowd. I could not find anybody who was actually from Tampa originally. They all had their home town allegiances that predated their moves to Florida. This makes it difficult to create any real pride in a team as young as the Rays. The team has only been around since 1998, but they already have an AL Pennant to their name. There are several reasons that I learned as to why the fans are not coming to the ballpark, but I will get to those later. It was a hot and muggy day in Tampa so the cool rush of air conditioned breeze on my face was a welcome feeling. I will admit though, part of what I love about baseball is sitting in the hot sun and eating out of an ice cream helmet. When I was at Camden Yards it was 90 plus degrees all day. It was hot and sticky. The free ice cubes that were given out melted before I got back to my seat. This may read as if I am complaining about the heat but I assure you, I loved every moment of it. I took the melted ice, or for you science nerds, the “water” and poured it into my hat. I put it on my head and let the cool water flow down the back of my shirt. Call me a lunatic if you'd like, but baseball needs to be played with the sky overhead. There is quite a bit to do inside Tropicana Field. As the gates opened I was immediately greeted by the giant sculpture pictured right jutting out from the wall. I don't know why this nameless Rays player is so sleepy, but it looks like he is about to make one heck of a grab! As I mentioned above, the Rays organization is trying everything they can to bring people out to the ballpark. Inside there is a carnival, live music, a cigar bar and the absolutely incredible Ted Williams Museum and Hitters Hall of Fame. I honestly could have spend hours inside this museum which has exhibits on Williams, Mays, DiMaggio, Mantle Marris and more. I had been impressed with the Nationals for honoring the history of baseball simply because they had pictures of non-Nationals players adorning pillars throughout the stadium. What the Rays have constructed inside Tropicana Field is impressive enough to be it's own stand alone attraction. The museum is worth the price of admission alone. There is one thing at Tropicana Field that everyone I spoke to leading up to the game told me I needed to do. Do you know what it is yet? Beyond the right-center field wall is a 10,000 gallon tank of Cownose rays. I got their early enough that I did not have to wait in line. For those of you who do not know me, I am terrified of everything. I have had six near death experiences in my life so I tend to not court death. As I found myself surrounded by small children shoving their hands inside the tank, I reminded myself that I am a fully grown adult male and that I should not be afraid to touch these Cownose rays. Yet all I could think of is that if a stranger randomly reached out to touch me on the top of my head I would probably turn around and bite them. Ok, I may not bite them, but I wouldn't be very happy. Several of my friends had mocked my apprehension to touch the Rays so I slowly reached out and held my hand over the water. In the picture above you can see that my fingers are barely touching the water. I let the ray decide if he/she wanted to be touched and lo and behold the thing arched its back out of the water and slid up against my hand. I touched a Cownose ray. To those who doubted my manhood, I hope you are happy now. After facing down the rays tank, I was in need for some sustenance. I headed to the Everglades BBQ restaurant located above center field. Once again I was reminded of Nationals Park. Much like the Red Porch restaurant in DC, Everglades BBQ had seating for fans to give them a great view of the entire field. I decided not to sit in the restaurant in favor of exploring more of the stadium, but I picked up a pulled pork sandwich to eat as I walked. The food that I am eating is getting better and better. It is going to be hard to compare each meal, but this sandwich was unbelievably good. At the beginning of this post I mentioned that being inside Tropicana Field felt like being inside of a mall. I do not mean that as derogatorily as it seems, but this was truly a different experience for me at a baseball game. It felt like there were more stores and booths inside that offered things like custom jerseys, hitting practice for kids, baseball cards and memorabilia than any stadium I have been in before. There may be parks that have more stores than Tropicana Field, but the way in which this domed stadium is constructed makes it feel like you are at a shopping center that happens to have a baseball field in the back. I have written more about my pregame experience in this post than any other so far, and I genuinely did have a great time at the game, but it really was different. Now it was time for some actual baseball. I have seen some great pitching on my tour and tonight was no exception. 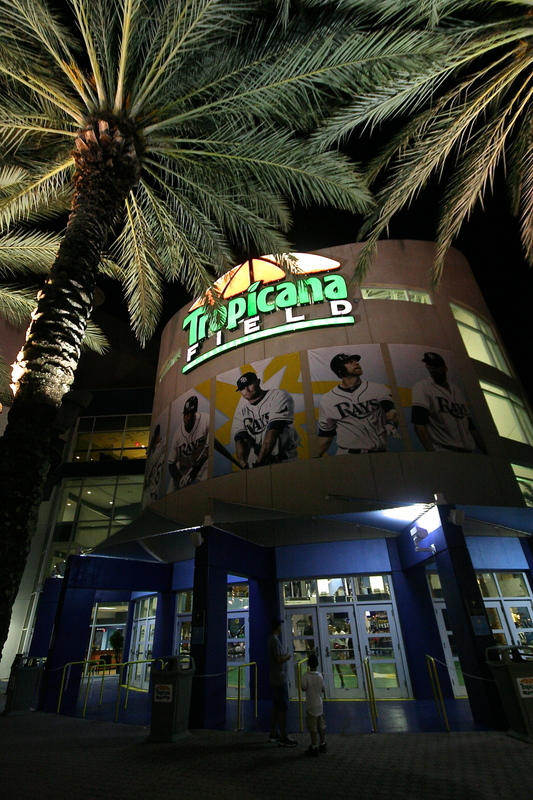 Rays rookie Chris Archer toed the rubber for his first game at Tropicana Field and threw a masterpiece. Archer gave up two hits allowing only one run over seven innings. The last time I watched Jason Hammel pitch for the Orioles he was giving up back-to-back-to-back home runs to the Tigers at Camden Yards. Tonight he two pitched brilliantly. Unforuatenly in these games it usually comes down to one mistake pitch, which Hammel made in the bottom of the seventh. Desmond Jennings played the hero in tonight's game when he launched an absolute bomb to straight away center. The crowd of 13 thousand went as wild as 13 thousand people can. There is no way to talk about this stadium without bringing up the dismal attendance the Rays attract year after year. I spoke to some locals about why this is and the answers were largely the same. Traffic is a killer. There is no way for the people who work in Tampa to make it over the bridge in time and there are not enough people in St. Petersburg to fill the stadium on any given day. That coupled with the high number of snow birds that occupy the surrounding areas makes for a smaller pool of Rays baseball fans to pull from. When the Red Sox and the Yankees are in town the place fills up, but even with divisional rival Orioles in town on a Friday night, the place was only 39% full. The Rays are doing everything they can to entertain their fans from putting a winning team on the field to holding great promotions throughout the year. My night ended participating in one of these promotions called the center field shuffle. When the game is over, the lights go out and the fans get to leave the stadium walking on the field and exiting through the center field wall. There is a DJ that comes out and lights that start flashing as people dance around the outfield (tonight it was in celebration of a Rays victory). This honestly was a lot of fun. Despite the low attendance and the roof over my head I had a really great time tonight. If you find yourself in Tampa I highly recommend catching a Rays game.